I’m not a smoker and, in fact, I think its a pretty silly way to spend your time, but I have to admit that there are some terrific songs on the subject, both for and against. We started the program with Tex Williams and His Western Caravan with SMOKE! SMOKE! SMOKE! THAT CIGARETTE, a western swing novelty song recorded in 1947. While the line “Ive smoked all my life and I ain’t dead yet” suggests that the song is pro-smoking, the chorus includes lines like “Puff, puff, puff … smoke yourself to death”. So Tex is having a two way bet, let’s just say. 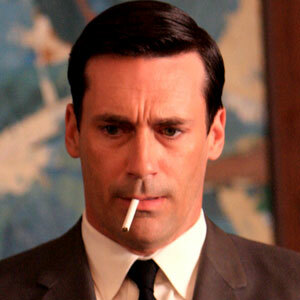 Here Tex’s song is used brilliantly to illustrate all the smoking on my favourite TV series, Mad Men. This video will have one of two results: The repetitious, perfunctory and seemingly pointless act of inhaling smoke may turn you completeley off smoking cigarettes. Or, the fact that this repetitious, perfunctory, and seemingly pointless act is carried out by such debonair, dashing human beings will make you run to your corner store and chimney down a carton before dinner. Either way, advertising works. We couldn’t leave out references to tobacco’s more pungent partner in crime, marijuana. Before this recreational drug was criminalised in the US, there was a fertile genre known as reefer jazz, of which Ella Fitzgerald’s WHEN I GET LOW I GET HIGH is a lively example. When it comes to Bluegrass, Jimmy Martin was known as The King. He recorded a great smoking song called I CAN’T QUIT CIGARETTES in 1966. Talking Heads do a great version of TAKE ME TO THE RIVER “take my money, take my cigarettes I haven’t seen the worst of it yet…” and, of course, there’s Otis Redding, mixing caffeine with his nicotine on CIGARETTES AND COFFEE. Neil Young’s ROLL ANOTHER NUMBER (FOR THE ROAD) is from his most uneven album ‘Tonight’s the Night’ on which he looks back at Woodstock through a fog of smoke, which probably explains a thing or two about the quality of the album. Rufus Wainwright contributed his charismatic 2001 showtune, CIGARETTES AND CHOCOLATE MILK. Everything he likes is just a little bit harmful for him (know the feeling!). 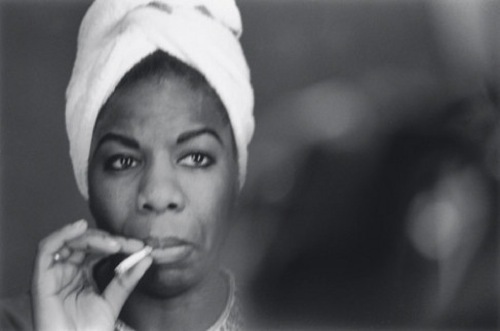 Jazz legend Nina Simone has some good advice: DON’T SMOKE IN BED. She recorded her version of Willard Robison’s piece in 1958. And in 1959 a completely different style of music was being recorded by Joe and Rose Lee Maphis. Their honky tonk style of country music was also a crowd pleaser, with its old fashioned views about the role of women in society. Well it was 1959 folks. The song is DIM LIGHTS, THICK SMOKE (AND LOUD, LOUD, MUSIC). My pick from the multitude of reggae songs that celebrate weed is U Roy’s CHALICE IN THE PALACE because it has to be the most unusual of the bunch. Inspired by a dream, he outlines his plan to bond with the Queen over a hashpipe. Cool. Ry Cooder proved, once again, that he must be the best slide guitarist in the world with a very nice live performance of FOOL FOR A CIGARETTE. Canadian Hawksley Workman works a nice piece of sexual metaphor on JEALOUS OF YOUR CIGARETTE. I had to include the Happy Mondays song LOOSE FIT, if only because it starts with someone lighting up and inhaling. Then it was a cruisy little number from Camper Van Beethoven who suggest we get high while the radio’s on. The song, GOOD GUYS & BAD GUYS, is a great example of the slacker ethos of the late 80’s. Steve Miller reckons he’s a joker, a smoker and a midnight toker on The Steve Miller Band’s song JOKER. Brownsville Station’s SMOKIN’ IN THE BOYS ROOM took me back a few years. Remember when being a rebel was sharing a pack of Peter Stuyvesant’s behind the toilet block? Seems so distant now doesn’t it? I love to play a little Pink Floyd now and again and HAVE A CIGAR from the album Wish You Were Here was perfect for this week’s show. The Editors recorded a song about one of my big bugbears, SMOKERS OUTSIDE THE HOSPITAL DOORS. It drives me crazy when I go to visit someone in hospital and I see hospital workers and visitors congregating outside the hospital entrance smoking their lives away. Grrrr. Super Furry Animals gave us a rambling, rousing slice of smoking philosophy on SMOKIN’, which we followed with REEFER MAN from Baron Lee and The Mill Blue Rhythm Band. For all you Francophiles out there: Serge Gainsbourg and Catherine Deneuve want you to know that they’re big cigar fans. They even contend that God smokes them. I’m no theology expert, but who knows, they may be right! The song is DIEU EST UN FUMEUR DE HAVANES. A couple of country songs on the subject of smoking: Lefty Frizzell with CIGARETTES AND COFFEE BLUES and a classic: Patsy Cline with THREE CIGARETTES IN AN ASHTRAY. k.d. lang is a huge Patsy Cline fan and she’s covered many of her songs including THREE CIGARETTES IN AN ASHTRAY. And you’ve got to hand it to her for doing a whole album on smoking. So k.d. saw us out with a terrific song from the album Drag: MY LAST CIGARETTE. Next week our show falls on March 8th which is International Women’s Day, so its a given that I’ll be presenting a program that features all my favourite female artists. Get in touch if you would like to request a particular song or artist. I’d love to hear from you.